The Circle in Old Towne Orange is home town to the famous annual Chapman University Undie Run and is a favorite movie filming location. 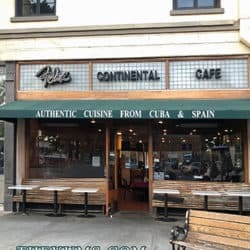 The birthplace of the Annual International Street Fair held on Labor Day weekend (now in its 46th year), is the perfect setting for Felix International Café specializing in Cuban and Spanish food. 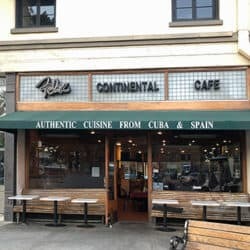 Location: Felix Continental Café is located on the Circle of Orange at 36 Plaza Square, in historic Old Towne Orange, California. Menu: Breakfast, served on weekends from 9 am until noon, offer the diner eleven different kinds of delicious international omelettes filled with crab and shrimp, or imported sausage from Malaga, Spain, or fried plantains in the Cuban style and are quite tempting. However, my favorite breakfast dish is Revoltillo de Salchicha (I continue to order this one because I learned how to pronounce it!). It’s two scrambled eggs with sausage, tomatoes, onions, bell peppers, and Swiss cheese. Combine that with the best latte in Orange County, and I am content. One breakfast side order not to be missed is the sinful Tostada Latina. It is cream cheese and jam nestled between two slices of French toast and dusted with powdered sugar. Traditional breakfast favorites include ham, bacon, sausages, or hamburger with eggs, pancakes or French toast. Lunch is served from 11 am to 5 pm and includes appetizers, refreshing salads, sandwiches, and omelettes. The lunch specials and typical cuisines offer countless ways of serving red meat, chicken, fish, and seafood. Reminiscent of street vendors in Old Havana, a popular item is Papa Rellena with meat filling, potato, and egg with bread crumbs. Along with another Spanish delicacy which are thin strips of squid lightly floured and deep fried. Empanadas, the handmade Cuban style meat pie, filled with seasoned ground meat and a single olive, make a convenient to-go package for enjoying later in the day. We also put them in our freezer to enjoy for a quick meal later on. The Felix Café Combination blends marinated Cuban style beef, chicken, pork, halibut, shrimp, scallops, garlic, onion, and bell pepper cooked on the grill. It is served with Spanish rice, creamy spinach, and fried sweet plantains. Maduros (fried plantains), tostones (twice-fried plantains), yuca (pronounced YOO-ka, the root of the Cassava plant), congri (Cuban black beans and rice) accompany the entrees. For those who are not so adventurous, there is a grilled boneless breast of chicken with tropical fruit and a salad. Dinner is served daily from 5 pm until 10 pm. Many of the lunch menu items are on the dinner menu. However, soup or salad and bread or rice pudding are included with the dinner meal. There are thirteen Caribbean specialties on the dinner menu with an emphasis on fish and seafood. Chicken, pork, steak, and filet mignon make an appearance, of course. The desserts in this section include tres leches cake, natilla (a Colombian-style custard) and rice pudding. Cuban style oxtail, for lunch or dinner, is a tasty deep casserole made by cooking the disjointed oxtail with olive oil, garlic, bell peppers, red wine, tomato sauce, black pepper, and seasonings. Thoughts: The breakfast service is unmatched. We’ve been going there so long and ordering the same thing each time that we don’t even have to look at the menu. The wait staff remembers what we like, and merely confirm what we are ordering that morning. My husband often spoke about having oxtail stew as a child. His grandmother made it for the family because it was a cheap cut of meat. Oxtail (the culinary name for the tail of cattle) is an excellent source of fat, protein, and is rich in gelatin. Now, with the popularity of Caribbean cuisine, the price of oxtail has climbed astronomically. If you’ve never had it, I highly recommend it. It’s a savory braised beef stew casserole. Visiting Felix International Café on the Circle, you can imagine you’re at a sidewalk café in Havana as diners enjoy their meals under umbrellas near the front door. Lively Cuban music plays inside that aptly fits the food and ambiance. Inside the Cuban cigar store, tucked in the corner next door, the scent of cigars adds further authenticity to the experience. Price Range: Breakfasts are $7 – $16; lunches are $9.50 to $17; dinners are $15 to $20. Previous Post Clyde’s in Georgetown, Washington, D.C.